90+5 The keeper collects the ball as the referee blows the final whistle, with Egypt again missing out on an Africa Cup of Nations spot. 90+5 A free kick for Egypt in the last minute of the match following a foul on Arafa. 90+2 Arafa El-Sayed spurns a glorious header wide following Emam's pin-point cross. 90+1 Mane curls a ball wide. 90' The referee give four minutes of stoppage time. 88' Free kick for Senegal near Egypt's area. 85' With the game growing largely boring, Senegal wins a foul inside its own half. 82' The visitors win a corner on the other end of the pitch. 80' The ball goes out for corner for Egypt. 80' Free kick for Egypt on the edge of the area. 78' West Ham striker Diafro Sakho replaces goal-scorer Diouf. 75' A yellow card for Soliman following a foul against an opponent. 73' The first substitution for the visitors, Alfred N'Diaye replaces Kouly Diop. 70' WHAT A CHANCE!!! Soliman makes a great run throught the middle before seeing his right-footed strike from outside the box miss the target by inches!! That was close! 66' Salah makes a superb surge into the box but eventually denied by Senegal's defense. 65' Hazem Emam replaces Ibrahim Salah, who's apparently suffering an injury. 60' Egypt seem to have thrown in the towel, the hosts don't look the least bit determined to come back into the game. 56' Arafa El-Sayed comes in for Mohamed Elneny. 52' A dangerous cross from Senegal from the right founds no one inside the box, with Senegal's two forwards waiting on the wings. 49' Diop takes a free kick but plays it wide, no danger. 45+1 The referee ends the first half, let's hope things would improve for Egypt after the break. 45' WHAT A CHANCE!! Dioup hits a curling shot that was denied by the woodwork, with keeper Sobhi beaten! 43' A through-on-goal Diouf denied a certain goal after being adjudged to have handled the ball inside the box. 36' Soliman is down on the floor injured, with an off-the-ball challenge widely suspected against the Ahly winger. 33' Trezeguet plays the free kick awfully wide! So disappointing for the home fans. 31' A free kick for Egypt down the left after Mohamed Salah was fouled there. 29' Three successive low shots for Egypt, but all were denied by the oppositions' legs inside the box...The home side look to be improving. 25' Soliman, who switched positions with Mohamed Salah, exploited the gap on Senegal's left flank before passing to the latter who struck straight into the keeper with his weak right foot! The fans were waiting for a much better execution from the Chelsea man. 24' Badje hits a venomless shoot wide..
23' A team move ends up with Trezeguet blasting wide! 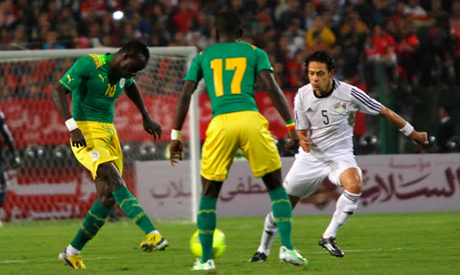 21' Senegal are now sitting deep in their own area, with Egypt struggling to find a break through a dogged defense. 18' Mane gets around the challenge of three Egyptians down the left as Salah eventually intercepts to clear the danger. 15' Ibrahim Salah makes a foul against Diop, as the referee warned the Egyptian verbally only. 14' A corner for Egypt, but a mix-up inside the area ends up with nothing! 10' Shennawi forced off the pitch as Mohamed Sobhi replaces him inside the opening 10 minutes. 9' Keeper Ahmed El-Shennawi is the culprit this time around, wrongly coming out to meet a free kick as Diouf headed in the opener. 9' GOAL! Senegal take the lead! 6' A defensive blunder from Naguib saw Diouf burst forward before seeing his low shot narrowly miss the target! The Egypt rearguard should be more vigilant to the threat posed by their opponents. 3' Egypt dominating possession now, with Salah attempting to to get into the area but was denied by the opposition defense. The first half gets underway. 18:55 Apparently, the number of fans allowed in the stands are much more than the 30,000 only permitted to attend the match. 18:30 Sabry Rahil will be deputizing for the injured Mohamed Abdel-Shafi at left back, with Ahmed Fathi deployed in his traditional right-back slot. 18:10 Whereas a narrow victory with a one-goal margin, would make Egypt need to beat Tunisia at home in the ultimate group game. 18:05 The odds for Egypt are, a win with a two-goal margin or more against Senegal would make them need only a final-round draw at Tunisia, who already booked a place at the 2015 African finals. 18:00 The inclusion of Trezeguet would probably mean that Egypt coach Gharib will adopt a 4-2-3-1 formation, with Salah and Elneny in the holding midfielder role. 17:55 Young Ahly midfielder Mahmoud 'Trezeguet' has also been handed an uncharacteristic starting berth, which came at the expense of Ismaily's Amr El-Sulaya. 17:45 As expected, Egypt manager Shawky Gharib turned to veteran Emad Meteb to lead the frontline in the absence of his Ahly teammate Amr Gamal. 17:10 Fans started to flock on the stadium from 16:00 p.m, in a match that is widely expected to be attended by the maximum number of supporters allowed - 25,000.